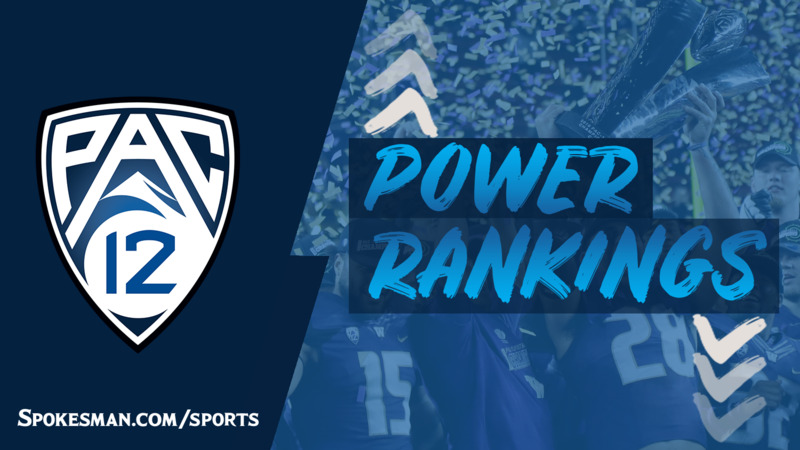 UPDATED: Tue., Nov. 6, 2018, 6:26 p.m.
With three weeks left in the regular season, both Pac-12 Conference divisions are still up for grabs, although there’s a lot more clarity in one of those divisions than there is in the other. Up North, it’ll be either Washington State or Washington. If the Huskies can avoid an upset in two weeks against Oregon State, the division will be decided for the third consecutive year by the 111th Apple Cup, set for Nov. 23 in Pullman. Here’s the situation in the other division: Utah, USC and Arizona all share a conference record of 4-3, Arizona State is 3-3, and Colorado and UCLA are both 2-4. We won’t go through every scenario for every team, but just know that all six mathematically are still in play for a South Division title. 1. Washington State (8-1, 5-1; last week: No. 1): Nobody would blame WSU for getting a head start on its Apple Cup film study. The Cougars have bought themselves the luxury of being able to lose their next two games, to Colorado and Arizona, and still win the Pac-12 North by beating the Huskies in the season finale. 2. Washington (7-3, 5-2; last week: No. 4): The Apple Cup should be a Pac-12 Championship play-in game for both teams involved, but the Huskies, on a bye this week, still have to take care of Oregon State in two weeks’ time to guarantee they’ll have that opportunity. 3. Utah (6-3, 4-3; last week: No. 2): Tyler Huntley’s broken collarbone puts a damper on Utah’s chances of winning the South, but certainly does not eliminate them. Huntley and the Utes did themselves some favors early on when they beat Arizona and USC. If Utah can win its final two – vs. Oregon and at Colorado – the Utes will book a date in Santa Clara, California. 4. Stanford (5-4, 3-3; last week: No. 3): Seven points will be what separates Stanford from the Pac-12 North title. The Cardinal dropped a 41-38 heartbreaker to Washington State in Palo Alto, then lost 27-23 to Washington in Seattle, effectively killing their conference championship hopes. 5. Oregon (6-3, 3-3; last week: No. 5): The Ducks became the conference’s fourth bowl-eligible team last Saturday, beating UCLA and former coach Chip Kelly, but they should be kicking themselves, too. They’d still be in the thick of the Pac-12 North race had it not been for an aggravating overtime loss to Stanford in September. 6. Arizona (5-5, 4-3; last week: No. 9): In two games against Colorado, Arizona quarterback Khalil Tate has been responsible for 846 offensive yards and 10 touchdowns. The Wildcats’ quarterback looked more like his 2017 self last Saturday, and a bye week should give him even more time to heal before Arizona travels to Pullman. 7. Cal (5-4, 2-4; last week: No. 6): Over and over again, Cal’s defense stymied the conference’s top offense and its top quarterback. Once the Golden Bears find a quarterback of their own, it seems like they could become a legitimate threat to win the Pac-12 North. 8. USC (5-4, 4-3; last week: No. 7): The Trojans exploded for 332 yards on the ground one week after Clay Helton dismissed his offensive line coach and took over play-calling responsibilities. If the new plan was “Run the ball and run it some more,” it certainly worked for the Trojans, who got 205 yards from Aca’Cedric Ware and 101 from Vavae Malepeai. 9. Arizona State (5-4, 3-3: last week: No. 8): How much more does N’Keal Harry have in the tank? That could be what determines how the Sun Devils fare in their final three games. ASU is one game back in the South. If Harry, who’s had five touchdowns in his past two games, can lift the Sun Devils against UCLA and Oregon, their season finale in Tucson could be a big one. 10. Colorado (5-4, 2-4; last week: No. 10): For the fifth time in five weeks, the Buffaloes will have a shot at a postseason bid when they host the Cougars on Saturday. Colorado’s most recent win came 1,525 Gardner Minshew passing yards ago. 11. UCLA (2-7, 2-4; last week: No. 12): The past two losses for UCLA, in which the Bruins were outscored 83-31 by Utah and Oregon, looked much more like the first five games of the season, rather than the sixth and seventh when coach Kelly’s Bruins rallied for wins over Cal and Arizona. Those two victories will seem much more distant if the Bruins can’t get anything done in their final three games. 12. Oregon State (2-7, 1-5; last week: No. 11): The good news for Oregon State? Jake Luton is healthy and playing well – really well, actually. The bad news for Oregon State? Luton’s eligibility clock expired in three games and the Beavers are mathematically out of postseason contention. Published: Nov. 6, 2018, 4:50 p.m. Updated: Nov. 6, 2018, 6:26 p.m.